Rejoicing with Katie, over the safe arrival of her little one. Enjoying looking forward to a nice lazy, rainy weekend, with no plans, other than knitting, reading,cooking some good food, drinking lots of tea, and spending time with the family. From the latest episode of Downton Abbey: This table full of good food~makes me think a bit of some of the pictures of our table. “Long ago I yearned to be a hero without knowing, in truth, what a hero was. Now, perhaps, I understand it a little better. 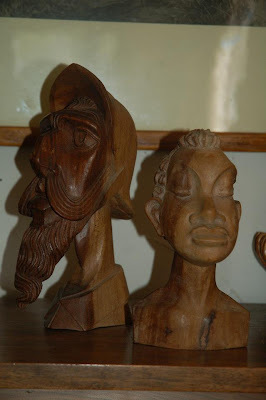 A grower of turnips or a shaper of clay, a Commot farmer or a king--every man is a hero if he strives more for others than for himself alone. Love your post! :) What season of Downtown Abby is that? How many are there? 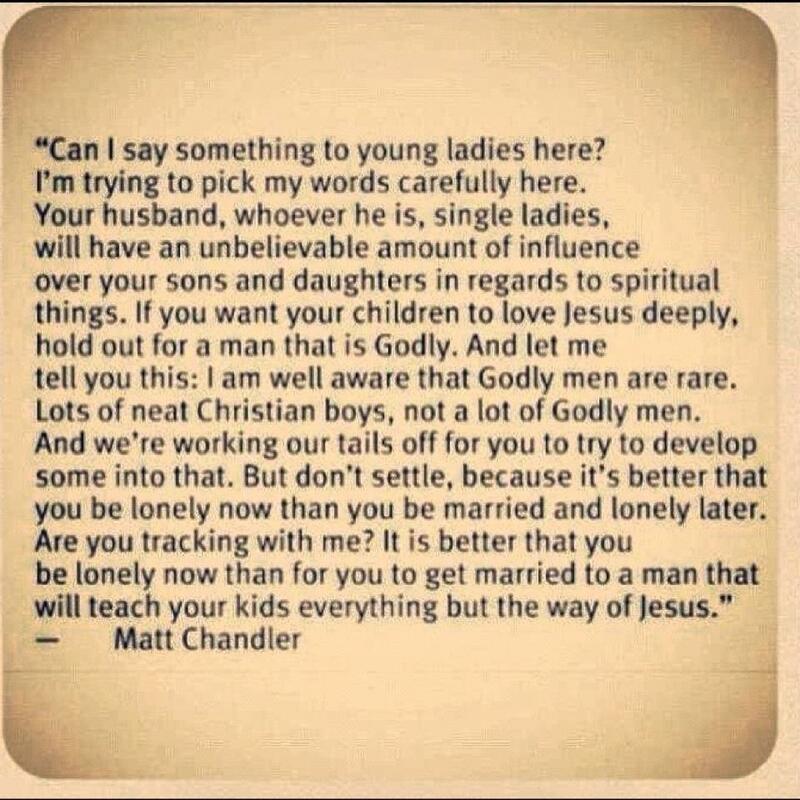 I love that bit by Matt Chandler...so TRUE. Thank you...I just celebrated 10 year with a man that loves the Lord Jesus wholeheartedly...I need to thank the Lord more purposefully for that! I married a godly man, who was a youth leader, a praise band musician and an elder in our church. We had two children, and then he wandered away from the Lord, had an affair with someone from church and left me to raise my children alone. That was 14 years ago. There are no guarantees in this life, except the love of our Lord. I too am rejoicing with Katie! So sweet! That quote at the end? So true! I'm going to show it to my girls, and maybe copy it to facebook! Can I say first that I am so very sorry to hear your story? Truly. I think that you have a very good point there though. I believe that just because a man (or anyone, for that matter), is involved in church activities, missions, or is a pastor, deacon, etc. does not make them a "Godly" man. I have met many, many, men that are "nice" men, "good" men, but very, very, very,few that are Godly men. And there is a big difference between the two. From my (limited) experience, "doing" for God does not make any man more or less Godly, it is totally what is inside that counts. 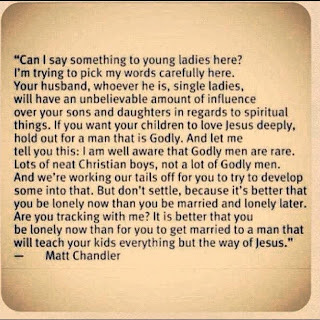 And, I think what Matt Chandler is saying here is really good~so many young ladies today are looking around, wanting to get married (and rightly so), and, since the Godly men are so far and few in between, are settling for just a "nice, good, moral" man. How are you able to watch DA here in the States? I thought it wasn't here til net year? Just curious. And waiting for a truly Godly man, may seem to take a long time, may never even happen for all who seek, but is well worth the wait when it happens. 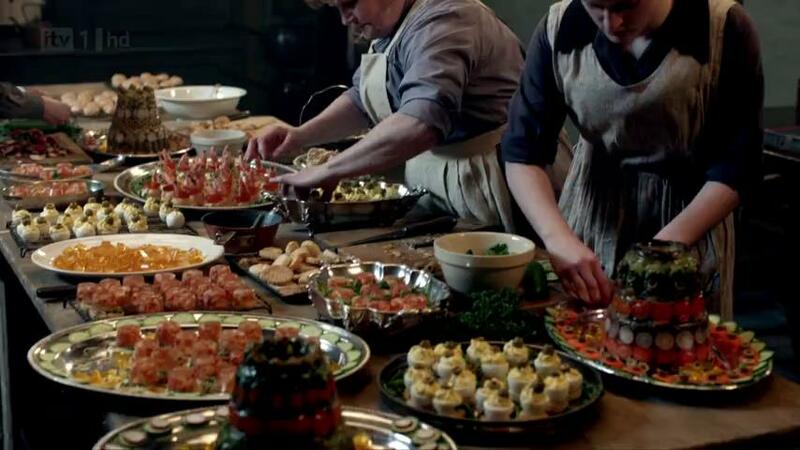 You must be watching Downton Abbey online? I just wrote my latest Mom Heart post and it is about sowing and reaping. It was inspired by seeing a wedding picture of our entire family. No matter what success the world has to offer, it is their choice of spouses that brings me the most joy. I find it remarkable to chat with my oldest granddaughter (now ten years old) about literature and cooking and baking and knowing they all are being raised in a home that puts God first. Now that my son has married a godly young woman (not perfect by any means but perfect for him), I know their children will also be raised in a home that honors the Lord. Your weekend plans sound perfect to me!! !